I’m back! 6 hours of sleep, and now I am refreshed and ready to move on to the SPOILERS review, after having already written the No Spoilers review. Which will be super fun for me, having just spent a month learning in detail everything about what “really” happened in Sanjay’s life (you can read that here). And therefore knowing just what this film changed. Which is EVERYTHING. This entry was posted in Uncategorized and tagged Dia Mirza, Paresh Rawal, Ranbir Kapoor, Review, Sanju, Spoilers, Tina Munim, Vicky Kaushal by mredlich21. Bookmark the permalink. The best reviews contextualize films within the culture and politics at the time they were made, which this does. So thank you for that. It also makes me really mad at Hirani and all the other people who are complicit with the rightward swing of politics the world over. 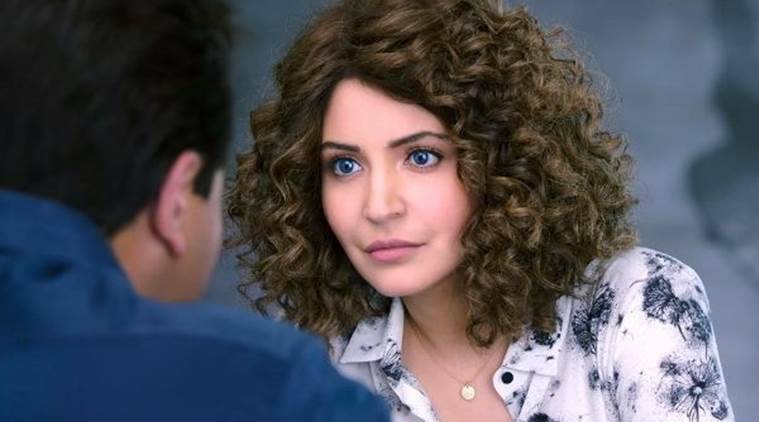 On a completely shallow note, I have very thick curly hair and Anushka’s wig is atrocious. Just look at the part and how it sits on her forehead. Criminal! Yup bal Thackeray babies masjid were never brought about. So y was he afraid for his family. Hirani said in an interview for PK that he styled Anushka in Pixie cut for that film because (paraphrasing) the coolest most interesting women at his college had short hair, so he had a crush on that look. So maybe we are just experiencing the various women Hirani has been interested in, via the looks they sported? Reminds me of Julio Iglesias “to all the girls I’ve loved before” haha. The blue contacts still bother me more. Just, why???? You have covered everyrhing I want to say. Yes ranbir is getting all the accolades. Vicky kaushal is being praised a lot. Raju Hirani has put a his hard work etc gathered till now into drain by making this movie. Sanjay dutt is innocent and the media is responsible for his bad press as if he was a Saint. It’s their prerogative to show what they want but don’t whitewash everything. And where we’re khalnaayak vaastav and other movies from 1990’s. JUST SHOWED mynnabhai and rocky as if rest do not matter. Didn’t bring 1 nuance of dutt ahab. Reviewers are giving 3.5 to 4 stars to the movie as it raju Hirani who can do no wrong.they are telling not whitewash but the biggest whitewash in history. After 10+ years Heck for children of today history has been re written and this would be gospel. Yes! where were the 90s movies? It’s Sanjay’s creative and popular peak, and they ignore that whole part of his career. Because it would bring up a version of Sanjay they don’t want, the wounded broken-hearted but still trying Sanjay, that was what came through onscreen in the 90s (not this manic ladies man cheerful idiot type) and that’s what people responded to and still respond to today. The Sanjay of Saajan, of Sadak, of Khalnayak even. He can’t be reduced to just a muscle man, he was so much more. But then Ranbir can’t play that, the broken man struggling through, the best he can manage is the boyman who won’t grow up. So we got Munna Bhai and Rocky instead of all the other brilliant performances that Ranbir couldn’t even come close to matching. If we want to compare I feel a har was better than Sanju. At least azhar stayed relatively close to the events. Also it had hunmable songs. Azhar was pretty gosh awful, but you’re right, at least it stuck sort of close to the events. Didn’t erase his first wife, for instance. This has got to be your meanest review of a Hindi film. Qn-do they convey the message that Munnabhai resurrected Sanjay’s career? I thought his second innings took off after Vaastav. Sounds a bit self-congratulatory on Hirani’s part to credit it all to Munnabhai series. Also no mention of his sisters? Also seems Hirani has again used the radio show/talk show trope to bring the happy ending ? And it doesn’t even make sense! He has this whole concept of Sanjay not being able to communicate from jail so he has to send coded messages through the radio show. But, Sanjay was out on furlough every few months, couldn’t he have just done it then? That’s the point of the furlough system, for prisoners to be able to communicate. Also, he was able to send letters from jail and talk to his wife and lawyers, it wasn’t like he was completely cut off from the world. it was just a ridiculous choice and actually makes more sense to me now that you remind me Hirani has a thing for radio shows. Hirani’s characters need an audience to impart wisdom to & clap in return. Sisters are in the background, but I’m not even sure they have dialogue. Certainly no dramatic part of his life, not even in the “present day” sections. I am sure it is because they didn’t sign disclaimers, which is fine, but also a little distracting since they focus so much on his relationship with his father and this whole other part of his family life is left out. And the Munnabhai thing is much worse, they credit that film with teaching Sanjay how to act, and how to work. Which erases Naam and Vaastav, his two remarkable performances that resurrected his career before Munna bhai, along with all the slightly less remarkable but still wonderful performances (Sadak, Khalnayak, Saajan) for which he certainly read the script in advance and prepared for the role. And also suggests that he was a 40-something actor and star for 20 years who had never previously bothered to work at a performance. Which is kind of insulting to the entire film industry, and also extremely superficial. Plenty of actors (Sanjay included) don’t work at every performance, but they have to put in the work on at least a few films if they want to stay popular. This film is saying that Sanjay stayed on top for no reason I guess? Just popular because he was popular? Yeah, I pretty much hated this film. I don’t like Ranbir at all, and even this performance seemed very similar to his other performances like Rockstar. Like everybody else has pointed out, what about Sanjay Dutt’s first 2 wives? Daughter? I almost forgot that Sanjay is also an actor, because it’s so rarely mentioned. Manisha in the Kar har Maidan Fateh was Soo melodramatic, and it was so predictable that he would stop doing drugs after listening to the tape. Sonam and Dia barely got a few dialogue. Anushka trying to fake a British accent was so weird. The Karishma Tanna(Kamlesh’s girlfriend) episode was very cringeworthy, couldn’t believe it was Raju Hirani. I’m actually one of the few people who liked PK but this was absolute trash. Yes, the media twists stories, but you can’t ignore the fact that Sanjay had connections with the underworld. Also hated the scene where Vicky Kaushal hears Ranbir on the radio and starts bawling. So manipulative. The only performance I liked was Vicky’s. Interesting point about the tape being predictable. Because of course that is what happened in real life, his father gave him a tape to listen to and it helped him stop drinking. But there is a way to present it where it would be less predictable, feel natural and organic. Something as simple as him receiving a package from India while in rehab and opening it up and listening to the tape without realizing what it was and being surprised. Instead of this whole looooooooooooooooooooon build up to it. Oh, I didn’t know it happened in real. But yeah, the way it was shown was pretty melodramatic. I felt the whole movie was way over the top. Btw, how do you compare this with Mahanati? I didn’t like it that much either, the way they potrayed Savitri as an innocent, naive, angelic woman. I didn’t like either film, both of them avoided the reality of their subjects in harmful ways. Sanju avoided the issues with India at the time which lead to his life challenges. And Mahanati chose to minimize Savatri to be just a woman in love. This makes me sad. How much of the shying away from truths, both about characters and about the context in which the story takes place, was because of aiming for a commercial hit, or because of personal biases of the makers and producers? I wanted to see this in theaters, but now I think I’ll wait. Disappointed also that this role just ended up being another man-child role for Ranbir. I really do think he can do more than that, but maybe I’m wrong. They do go for the easy answers, in a way that feels like it just wants to give the audience something simple. Like, addiction is because your father put pressure on you. Friendships fall apart because of simple misunderstandings and then are fixed. All you have to do to stand up to mobsters is say “no”. The whole idea of a Sanju biopic, that feels like something Raju and Vinod might have wanted to do simply because they love Sanju and wanted to redeem him for the public. But then they found out it was almost unfilmable and had to make massive alterations for the sake of audience popularity (I think). So maybe the original impulse was out of personal bias, but then the changes were just to make it easy for the audience to swallow. I’m dreading Ranbir superhero movie, because I am sick of man-child superhero origin stories, and also sick of Ranbir manchild stories, so two at once is going to be extra bad. Oh heavens, I didn’t know he is doing a superhero story. Sigh. It’s Ayan Mukherjee’s dream, they’ve been working on it for years, started filming 2-3 years ago, stopped so he could finish Jagga Jasoos when that schedule got all messed up, then again when Sanju got all messed up, and now they are back on track. It’s supposed to be a trilogy starring Ranbir as the superhero Bhramastra and Alia as (presumably) his love interest. To me “trilogy” means origin story-struggle to balance life and heroics-final big battle. And I am so sick of origin stories. Yeah, with the special effects and the trilogy and everything, they will be filming intensely for years, no time for a real relationship anyway, perfect situation for a fake one. And it will keep the public interested and excited as we wait for the film to FINALLY be finished. And, most importantly, it will keep the focus off of whatever it is Ayan and Ranbir have going on. Haven’t yet watched the Sanjay movie since the past week has been super busy. And your review makes me feel even less enthusiastic.I already knew Kumar Gaurav and Namrata wouldn’t be there.But since we don’t even get a decent Dutt Saab.At least Brahmastra (the superhero trilogy) has Ayan at the helm.The next film with Luv Ranjan (Sonu ke Titu ki sweety) has me seriously worried.Though Ranbir has promised that there won’t be any of Luv Ranjan’s misogynistic rubbish in the new movie. I can believe there won’t be any of Luv Ranjan’s misogynistic nonsense, but I have less faith in it avoiding Ranbir’s brand of misogynistic nonsense. Women were not put on this world just to help him grow up and forget their own needs. Oh, and for Sunil they leaned heavily on the black turtleneck look for the 80s, which I can picture him in, but I don’t think he wore all day every day. I ended up seeing Sanju last night since I didn’t find Yes Boss and it was so bad. I agree with so many of the points that you mentioned. Especially the fact that Anushka does no research on her own. It was so frustrating that she would just believe whatever the last thing someone told her. One thing that also frustrated me was that I had no idea why I (as the audience) was supposed to be rooting for or even care about Sanjay Dutt. For example in Mahanati, we’re shown how talented Savitri was and how hard she and her family worked for her to become an actress which is why we wanted to root for her even when she was making mistakes. In this, they mention that Sanjay Dutt is such a big star but they never tell us how he became so big or why he was so popular. So all I’m left with is feeling bad for Sunil Dutt because he has had to go through so much. Plus half the time, I even forget that this is a biopic since it’s pretty similar to other characters that Ranbir has done before. Just the name has been changed. Oh now I am super interested in your last two points! I wonder if they re-wrote Sanju’s life and then cast Ranbir, or if they cast Ranbir and then re-wrote it. In “real life”, Sanjay deserved us to root for him because he overcame addiction, relapsed, overcame again, grew as a father, worked hard 24 hours a day even if he didn’t care about the films, and generally did a lot of stuff that doesn’t fit with Ranbir’s “poor little boy” persona. Anyway, glad you also did not like it! It was such a successful movie, I keep waiting for someone to get mad at me for my review, but so far not so much. I guess the people who liked it aren’t commenting on my blog. I feel like they probably cast Ranbir and then ended up re-writing it. Yeah, if Ranveer (for instance) had played it, I feel like it would have been more manic and less relaxed charming ladies man.